You had me at cheese! I love anything cheesy but never in my wildest dreams would I have thought to marinate cheese, until I ran across one of my old cookbooks (You'll laugh...I love to read, and my favorite thing to read besides a good novel is cookbooks!). 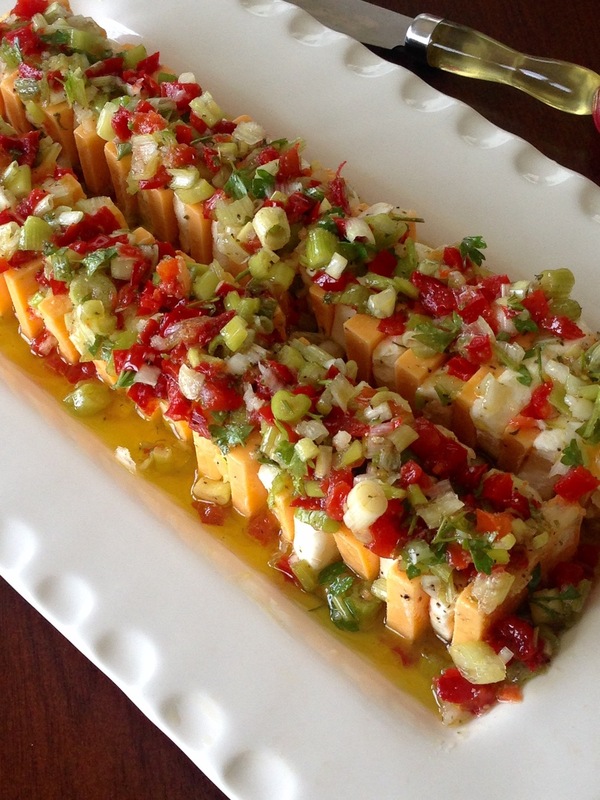 This appetizer recipe (adapted from the lovely folks at Southern Living) looks complicated, but it is actually quite easy and is always the "the big cheese" at any party. I thought I'd try our Pretty Peppers in lieu of the pimentos from the original recipe, and my oh my, the sweetness of the peppers and the savory ingredients, are the perfect compliment to the cheese. Add the first ten ingredients to a resealable container and shake to combine. Set aside. Slice the block of cream cheese in half vertically and then into 1/4-inch chunks. Do the same with the cheddar cheese. Stack them on their sides as pictured below in a shallow pan. Pour marinade over cheese, cover with plastic wrap, and refrigerate for at least 8 hours.